Well now this is a special one. A Bachelorette Party is a time for the Bride to enjoy a night out with her ladies! We are happy to be the first stop on the long evening that awaits any bride on the bachelorette party evening. Express & Create is a great place to get the evening started. With lots of laughs and tons of creativity, we can start the night off with a bang! We can facilitate an event at our studio, or a mobile event in someones home (or at a special location). 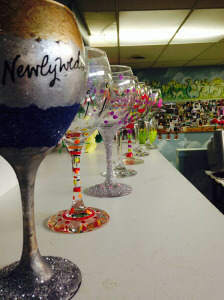 We can offer a painting party or a wine glass paint night. A group of ladies coming together to create something of their very own is a great chance to have a ton of fun! We have had bachelorette events where the group creates their own custom painted wine glass that they can use at the wedding! Do you have events prior to your wedding with the bridal party? Create these glasses to bring along to those events to add that extra touch to your photos. After all, having a one-of-a-kind item is another way to make a wedding day that much more special! In addition, we could offer an event where your bridal party can create something special to be used at your wedding. Perhaps you are DIY kind of bride…Express & Create can help! We would welcome the opportunity to offer our studio as a place for your bridal party and friends to come and use our materials to create special accents for your wedding day. We can help with centerpieces, place cards, or even special decorations for your venue. We would be happy to have a bachelorette event at our studio, or at any other location. We are a Mobile Art Studio, after all!